Germany is nearing completion of a three-year trial under which its worst heroin addicts are given the drug on the state. The heroin was given out in seven clinics in seven cities across the country. Bob Wylie has been to Hamburg to investigate the results. If you go to Hamburg these days you can't miss the Blue Goals. They are a modern art masterpiece for the World Cup - 120 fluorescent blue goals on buildings all over the city. 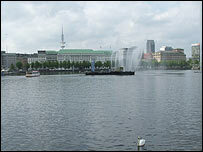 When the battle for the Jules Rimet Cup is in town Hamburg will host three matches including a quarter final. Big Frank Jerke says he can't wait. He'll be glued to the television and may even try to get a ticket for one of the games. Time was when that would have been unthinkable. Less than three years ago Frank was down and out, homeless and hopelessly hooked on heroin. It was around seven in the morning when I first saw him on Hoegerdamm Street on the outskirts of Hamburg's city centre. He's a big man. He stumbled off the bus and muttered "Morgen", as he passed me at the top of the steps. Downstairs he rang the bell at the Hamburg heroin clinic. 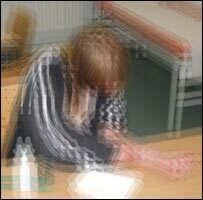 Inside he took a breath test to prove he had not had any alcohol and then he went next door into what they call the application room. There, under medical supervision, he was given a syringe with chemically pure heroin - diamorphine - diluted in water. He got up on one of the beds, dropped his trousers and injected it into his thigh. Dr Christian Haasen says the results are "significant"
He put his head back and closed his eyes for a few minutes then got up, left the clinic and went to work in one of Hamburg's ship repair yards - the same as he used to do all those years ago before the smack got him. "Everything is good now. I've got a nice flat of my own and a good job. Better," he says. He laughed as he left. These days his teeth are a credit to any toothpaste manufacturer. 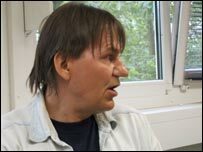 Frank is one of 500 drug addicts in Germany who are on the heroin pilot programme. It is being conducted in seven major cities across Germany. Hamburg is the biggest trial. German doctors looked at the success of heroin on prescription in Switzerland and then the Netherlands and after years of debate the Bundestag accepted that a pilot should be set up. The project started three years ago and was based on comparing heroin maintenance with methadone maintenance. Five hundred or so users were given heroin - they had to have failed on methadone beforehand - and 500 were given methadone. The results were published recently. On almost all counts the heroin group did better than the methadone group. 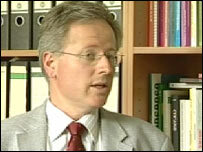 Dr Christian Haasen is the research director of the German trial. In his office at the University of Hamburg he tells me in a matter of fact manner: "The differences between the heroin group and the methadone group are statistically significant. "Those on heroin stayed in treatment longer and the drop out is less than the methadone group. They had much less illicit drug use, using street heroin and cocaine, and so have better health records." He says he knew from other heroin trials in Switzerland and the Netherlands that there would be differences but that even he was surprised at the improvements sustained by those on heroin. These positives also affect employment prospects. At the Hamburg clinic 40 of the clients are working out of the 90 going there to get heroin. Ludovic Leblanc, 32, is a waiter in one of the best Italian restaurants in Hamburg. His take home pay, with tips, is 2,400 euros, or £1,800. He's got a good flat in the city centre and looks every inch an aspiring head waiter when he's kitted out for work. Not bad for 15 years on heroin. Ludovic goes to the clinic twice a day - once in the morning before work and during his afternoon break. His employer knows about it. But in his kitchen 13 storeys up above the river Elbe, I put it to him that, remarkable as his progress has been, he's still stuck on heroin. "No, I hope to be drug free by this time next year," he asserts. He's now on a quarter of the daily dose of heroin he was getting when he started at the clinic two years ago. "I couldn't have dreamed of that on methadone. After a year and a half on methadone the dose stayed the same and I would go to get street heroin almost every night," he said. Doctors at the Hoegerdamm clinic say one in 10 are on sufficiently decreasing doses to be described as "moving towards abstinence". But the preliminary figures for the study do not show any remarkable difference between heroin and methadone in the numbers that finish drug free. Drug deaths are different. Since 2001 German drug deaths are down by 40%, according to Christian Haasen. A policeman made the same point about Hamburg. Ch Supt Norbert Ziebarth is the head of youth protection for Hamburg police. At the rather imposing Polizeiprasidium HQ in the north of Hamburg he tells me that in the time of the heroin clinic drug deaths in Hamburg have dropped from 101 in 2001 to 61 last year. The existence of the clinic, in a way, also allowed a police crackdown on what used to be Hamburg's open drug scene. There are no shooting galleries in parks or congregations of drug users at the central railway station, on the scale there used to be. The police support the trial and its extension. "It works for the worst heroin users. We support it," says Det Supt Ziebarth. Not that everyone is of the same view. The heroin clinic experiment was introduced by the Social Democrat government of Gerhardt Schroeder. Now the conservative CDU, led by Angela Merkel, are in power. They are altogether less enthusiastic about heroin on the state. I found that out when I met the Hamburg state minister of health, Dietrich Wersich. He disputes some of the findings of the German study and questions the costs of heroin on prescription - thus far three times greater than methadone. "The results for the heroin group were only slightly better than those of the methadone group," he says, "and they may have been due to other factors than solely the prescription of heroin, like better social services support and things like that." Herr Wersich is also dubious about what he describes as the state becoming in effect a licensed narcotics dealer. "For us to give patients a daily kick on heroin cannot be seen as a permanent solution," he said. "Instead we have to work to get them drug free and how can you say that's being done if the government is giving them a kick on heroin every day... and besides will the taxpayer be prepared to pay for this?" This weekend the Lancet published a research study of the Swiss heroin clinics, which have been running for 10 years. The study suggests that the Swiss model is responsible for reduced heroin use in the long term. Swiss drug deaths have plummeted in the last 10 years. The Lancet editorial points that in the same time the UK has had the highest drug deaths every year of any European country. The last official figures for drug-related deaths in Scotland was 356 for 2004. That was almost 50% higher than the figure a decade ago. So here's the question: Is it now time for Scotland to follow Germany and other European countries and introduce heroin clinics to give our worst addicts heroin on prescription? Bob Wylie's report from Hamburg will be broadcast on Radio Scotland's Investigation programme at 0900 BST on Monday. There will also be a special report on Newsnight Scotland at 2300 BST.